Ahhh, RVs. So many people’s retirement dream. But what’s one of the biggest complaints from owners? Showers are often unsatisfying, in large part because sometimes you just don’t have access to the amounts of water you’d want for a nice, long shower. Oxygenics’ product is the best around. This one has the two major features you absolutely want in an RV shower head: water boosting and a pause feature. This one aerates the water, making it feel like a greater volume of water is coming out, while still keeping the water usage low. Combined with the pause feature, you can take a navy shower without feeling grungy afterward. The design goes further than others we’ll look at today, ensuring rinsing is fast and thorough above all else, helping to minimize times you’re left with no water and soap in your eyes (here’s looking at you, last person to shower!). For the asking price (under $50) you won’t find a better product. Five settings make this a more luxurious option. 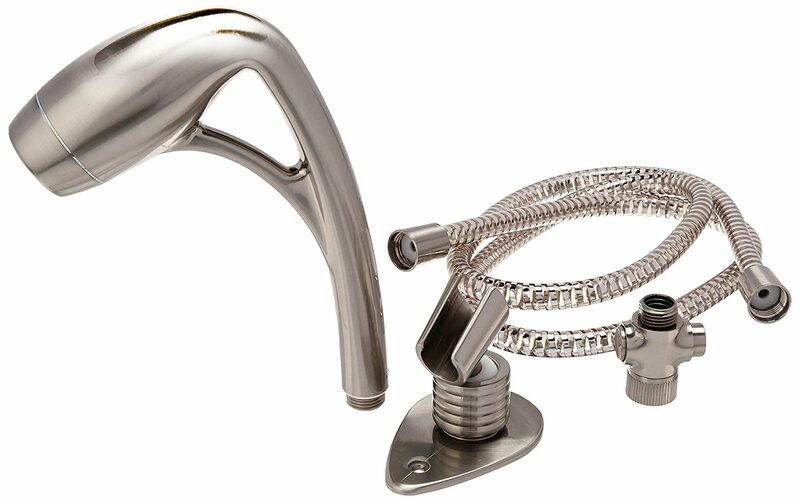 The construction is nothing to ooh and ahh over, but it does the job with its durable plastic and stainless steel hose (and rubber touch clean nozzles, as expected). Having more than two settings plus pause is a rarity though, and worth snatching this up. It’ll cost you a bit over $30, but that’s well worth it for a product that can work as well as any more general purpose handheld while still being great for your vehicle when you have to camp away from a campground or don’t have a proper water hookup at one. A nice looking, and effective model. This one takes third place, lacking the Oxygenics tech that artificially increases water volume and its specialized shape. This makes it an automatic step down, but it’s still pretty darn good. 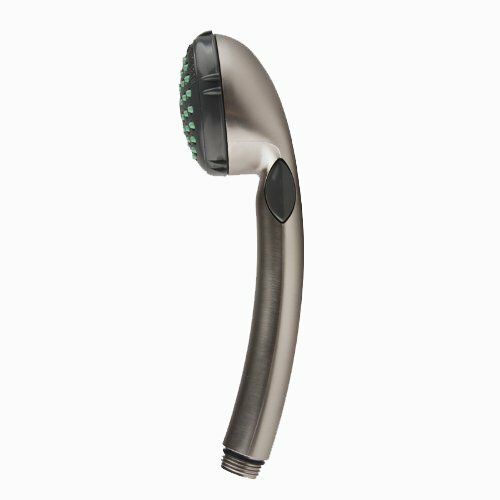 Sturdy plastic construction and touch clean nozzles make this one setting, not quite low GPM (it runs at 2.2 GPM) handheld shower head pretty great for its purpose, and it should easily survive being jostled around on the road. The price is nothing to complain about either, being about a quarter the price of the Oxygenics RV shower head (under $20). As expected, it has a pause feature, activated conveniently on the side of the handle instead of the face. 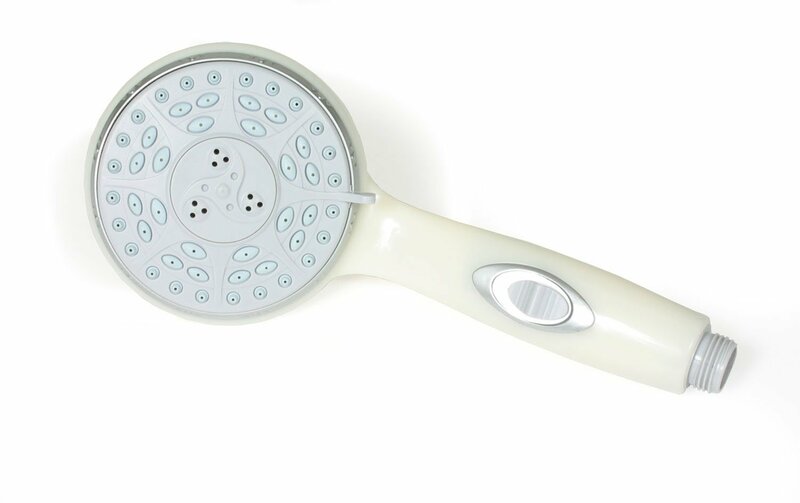 Ugly as sin, but makes up for it by being a solid multi function handheld shower head. Durable plastic and touch clean nozzles as expected start us off. Unlike a lot of our other entries, this one’s claim to fame comes from it actually having multiple settings: full spray, massage, and the expected pause option. The mounting is quite secure, making it less likely to bounce around so much while driving, and can take a bit of a beating if need be. Rather than aerating the water or simply being a slightly higher flow, this one uses a relatively low flow and boosts it to high pressure, which is great if you’re like me and love those kinds of showers. As far as price, it’s about the same as the previous option (under $20), and well worth it. Probably a familiar sight to you if you have a brand new vehicle (or it was new when you bought it, anyway), this is a replacement for an exterior shower head. No frills, really. Plastic, extraordinarily low flow, but you’ll be happy to have it if you’re in a pinch. The handle locks and unlocks with a press, making this the quickest on/off of any we’ve covered today. Just flex your grip a little and voila! Water shuts off or turns on for very fast navy showers when water conservation is your primary concern. It’s not much, but for little over $10 you can’t complain too much. Depending on your needs any of these will do, but I’d highly recommend giving Oxygenics’ offering a shot above all the rest. It’s specifically designed to make your life and water conservation easier, which is far and away the best any of these are able to do. It may cost a bit more, but not a ton, and does the job way better than any of the others. If you are looking for other choices for home or personal use, you can go to the link. There’s only one hard and fast rule for an RV shower head: it MUST, absolutely non-negotiable MUST have a pause feature. While a luxury in most showers, it’s a necessity for this type of vehicles, since sometimes you’ll need to take navy showers (wetting, pausing the water, lathering, turning the water back on, rinse, and repeat) because you don’t have a proper hook up. Everything else is secondary to that. 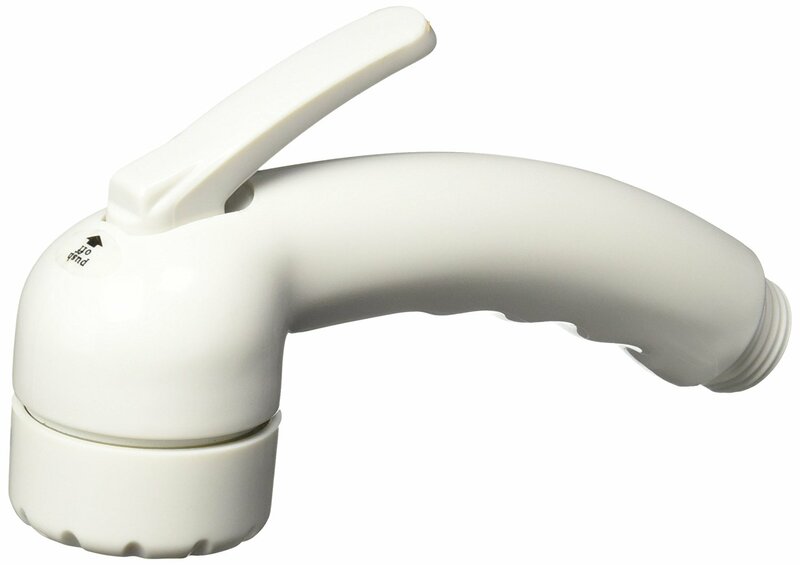 As far as what your product should be made of, it’s probably going to be plastic with rubber nozzles, as RV shower heads are very cheap compared to the market norm (under $30 is the usual). Any extra settings beyond “spray” it may have are a definite plus, as well as a relative rarity (most are single setting). 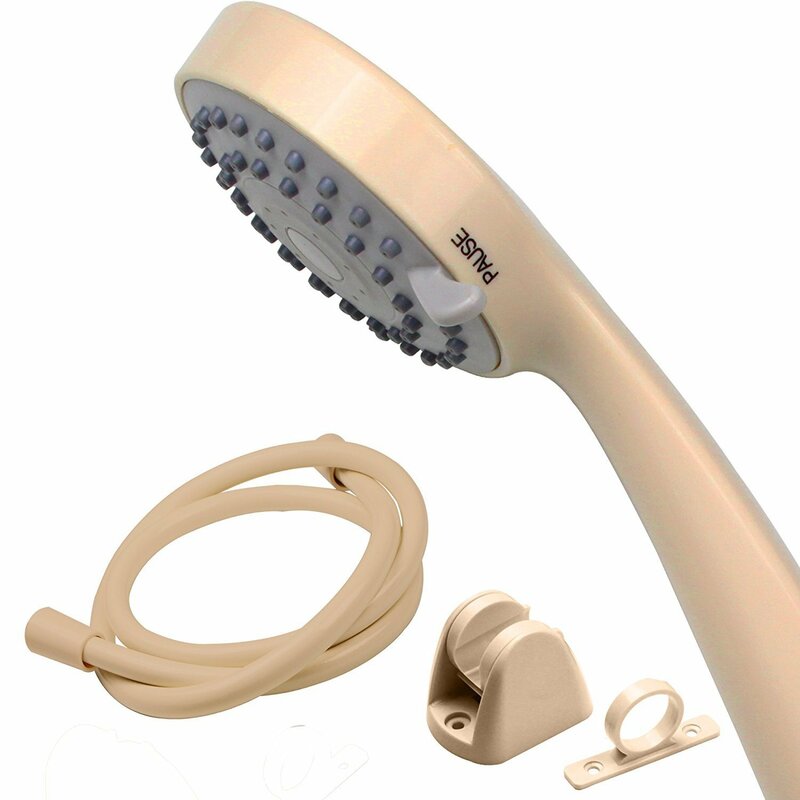 Unfortunately, variety is low among RV shower heads, so extra settings and unique designs (like our winners’) are what are going to take the day in this list.